1800 128 268 avant.org.au * IMPORTANT: Professional indemnity insurance products are issued by Avant Insurance Limited, ABN 82 003 707 471, AFSL 238 765. The information provided here is general advice only. You should consider the appropriateness of the advice having regard to your own objectives, financial situation and needs before deciding to purchase or continuing to hold a policy with us. For full details including the terms, conditions, and exclusions that apply, please read and consider the policy wording and PDS, which is available at www.avant.org.au or by contacting us on 1800 128 268. As a doctor, you stand by your reputation and our reputation is built on protecting yours. The fact is, no medical indemnity insurer has more resources or expertise to safeguard your reputation than Avant. 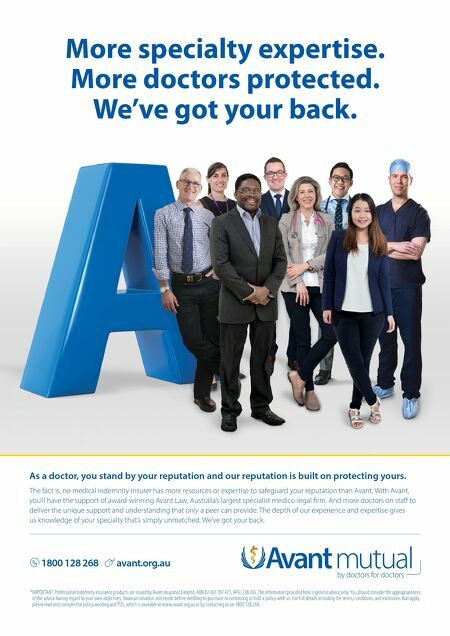 With Avant, you'll have the support of award-winning Avant Law, Australia's largest specialist medico-legal firm. And more doctors on staff to deliver the unique support and understanding that only a peer can provide. The depth of our experience and expertise gives us knowledge of your specialty that's simply unmatched. We've got your back. More specialty expertise. More doctors protected. We've got your back.